This poster was created in naive manner which resembled children’s drawings. Hammer and Sickle on the red flag above celebrates the victory over the fascist regime in a form of thrown down black German banners at the bottom of the poster. The soldier holds his hand high in a gesture of joy because the long lasting War is finally over. He is not an ordinary private – on his chest there is a Hero of the Soviet Union star medal meaning that he obtained the highest honorary title after performing a truly heroic deed. Also he is holding a sub-machine gun PPSh-41 – the predecessor of AK-47. 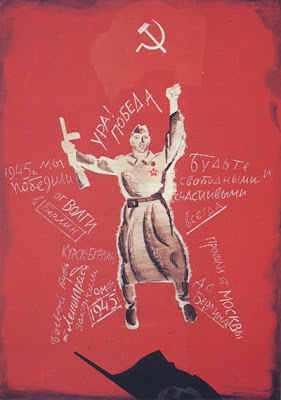 The famous war slogans and mottos written in chalk form the five-pointed Red Star – a symbol of communism. During the War people were often putting chalked notes and slogans on walls of the places they were passing by. The slogans say (counter clock-wise, starting from 5 o’clock): “Have gone from Moscow to Berlin” (the Germans managed to get 30 km near Moscow and only after the Battle of Moscow in 1942 were thrown back), “The war way from Leningrad was complete on May 9, 1945” (The Siege of Leningrad, also known as The Leningrad Blockade of 1941-1944 is one of the most dreadful events of the WW2, with more than 1.2 mln of Leningraders starving to death there), “Kursk-Berlin” (The Great Battle of Kursk in 1943 won by Soviets despite the outnumbering Germans and leading to the final counteroffensive), “1945 – we have won”, “From Volga to Berlin” (The Battle of Stalingrad on Volga River, which being the bloodiest battle in human history exhausted the Germans and led to the Victory) . The soldier’s head is crowned with “Hurrah! Victory” words. And the last phrase to the right is written with no inclination and is actually the message of the poster: “Be free and happy – forever”. You say this uses a 'naive' style, which I can see, however at the same time this is one of the more intelligent, sophisticated posters Ive seen on this blog. The restrained composition and imagery, and the use of the chalk quotes are all beautiful. Say, Alexander, do you know where one can buy reprints of the posters you blog about (except for allposters.com - they don't have what I was looking for). I especially liked the one with the child and the woman "Dont you ever lie". In response to Andrej's comment...look in the margins for "All Posters" ad. I've never ordered from them, but I have heard of them. My walls are full of QSL's and I don't know where I'd put another poster, but I agree the posters are striking. this site is so beautiful!!! The pics here are amazing, you can almost feel the emotional impact from these pics. this is so cute. yep, it has a naive style, and i think this is appealing especially to children. and i am amazed how they use chalk sketches as symbols. i remember watching "ballad of a soldier" where the apartment of a soldier's wife has a clalk sketch of a soldier.